This is for you if you can't sleep because of all the useful, or useless, thoughts running through your mind. Powering down calms your thoughts allowing you to switch off for the night. Let the pleasant music and my words help power you down to sleep. Get a feeling for it by listening to the snapshot above. Powering down is perfect for all ages from 16 up. Always listen when you are resting as it either sends you off to sleep, or lets you roll over afterwards and go to sleep. If you awaken in the night use it to relax you back to sleep. Listen at least 5 times in the first week, 4 in the second week, and then 3 times in the third week or continue until you sleep peacefully on your own. Come back to Powering down any time you may have trouble sleeping in the future. 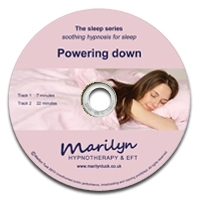 For an even more soothing approach A wave of relaxation is the sister hypnosis recording in this sleep series. Buy both and alternate for variety.